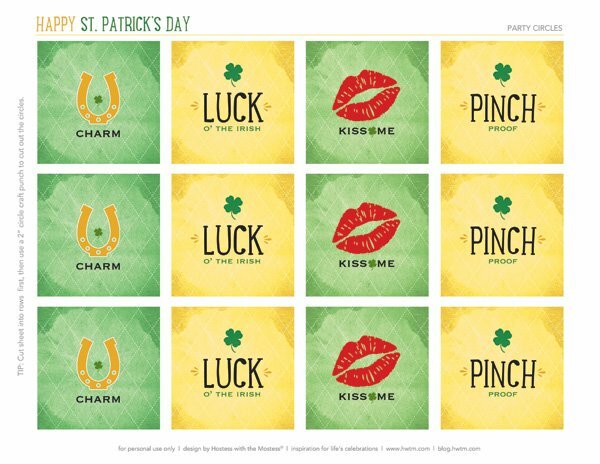 “Everyone does wine tastings, so I thought a beer tasting theme would be different, fun and in line with St. Patrick’s Day activities! 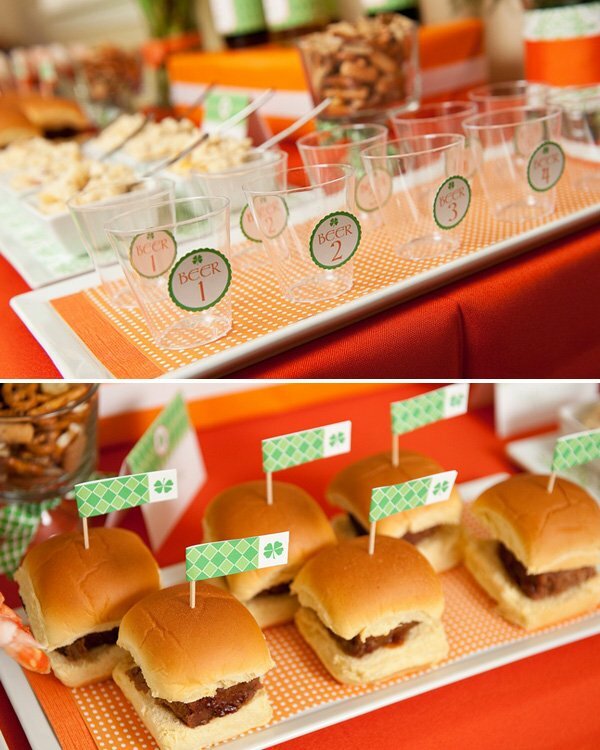 I chose traditional Irish flag colors of green orange and white, but tried to keep the feel chic and modern. 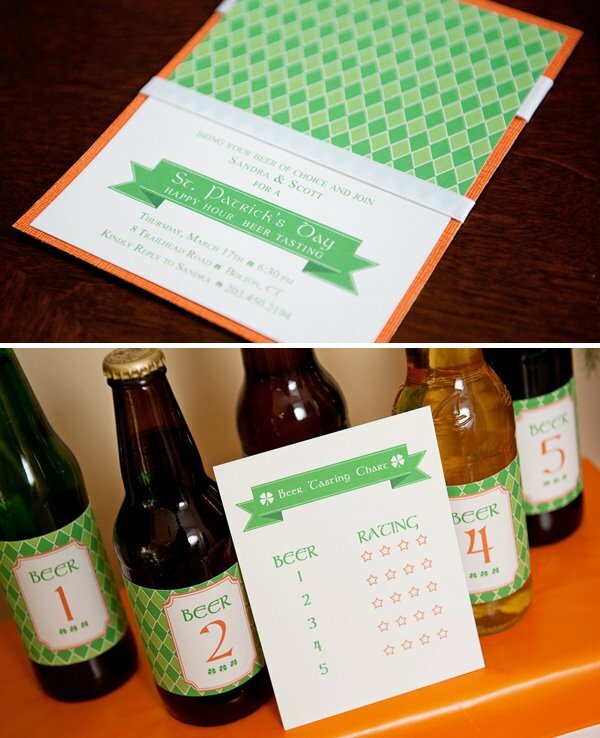 The invitation was a DIY printable invitation from Green Apple Paperie. I matted it with orange card stock and embellished it with white ribbon. I purchased 5 different beer types, removed all the labels and re-labeled the bottles 1-5 with removable labels. 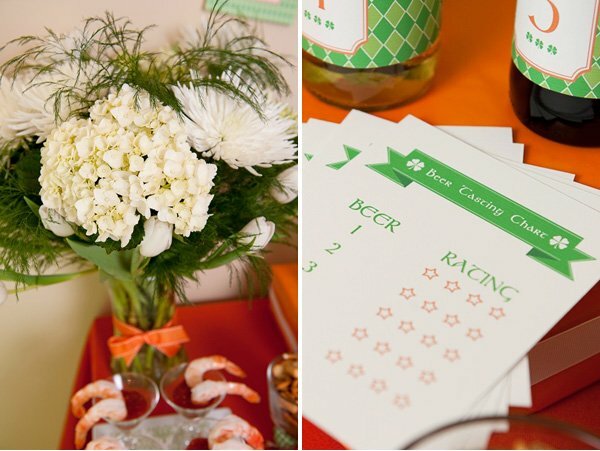 Upon arrival, each guest received a tasting card. On the tasting card, each beer is represented by its number, alongside a 4-stars rating system that guests used to rate the beers. There were little tasting cups that were also labeled 1-5 so that each beer could be tasted by everyone. 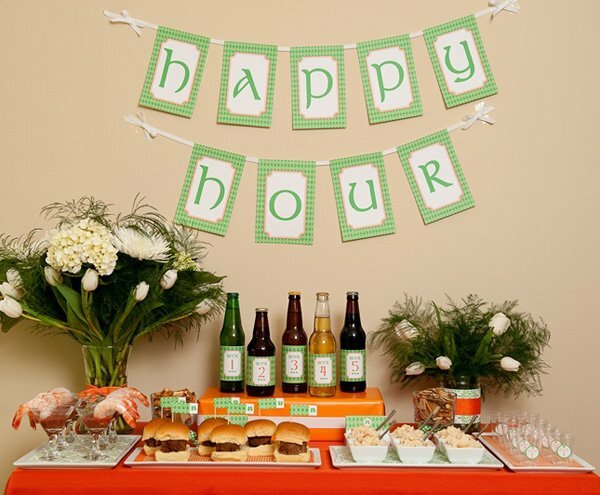 A “HAPPY HOUR” banner banner hung over the food table. Light food was served – just as you’d find during happy hour at a restaurant! Meatloaf sliders, shrimp cocktail, trail mix and loaded mashed potatoes. I picked up the mini bowls and mini martini glasses at Pier 1. Plates were lined with pretty scrapbook paper I found at Jo-Ann’s. The flowers were picked out from my local grocery store’s floral department. Wow so fun! 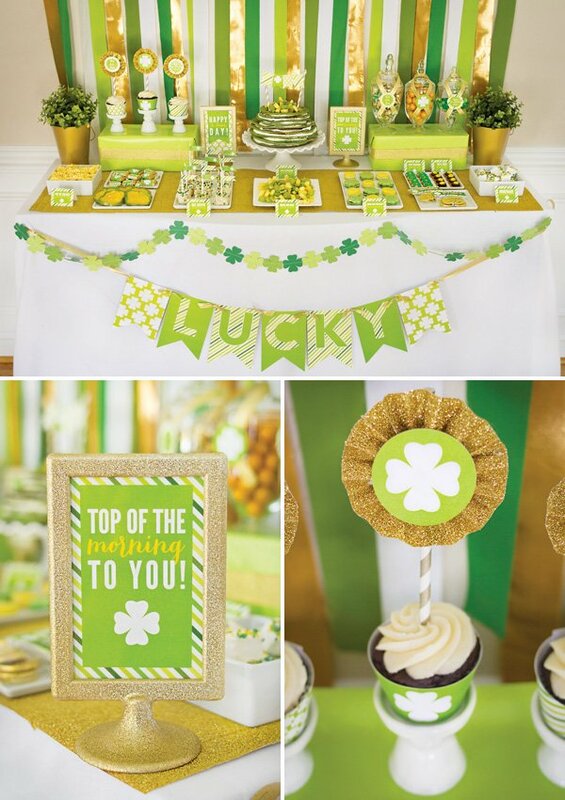 I”m passing this along to my friend who always hosts an adults only St. Patty’s party. 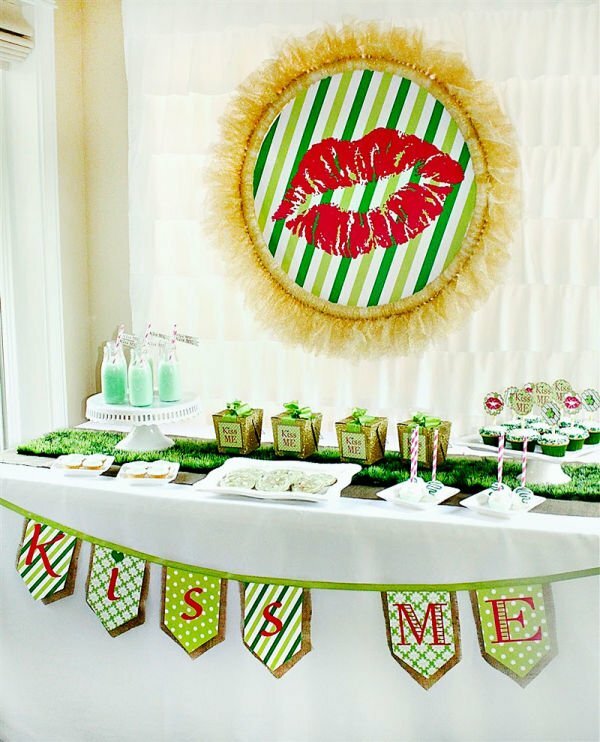 Great idea for an adult party!!! FUN!!!!! 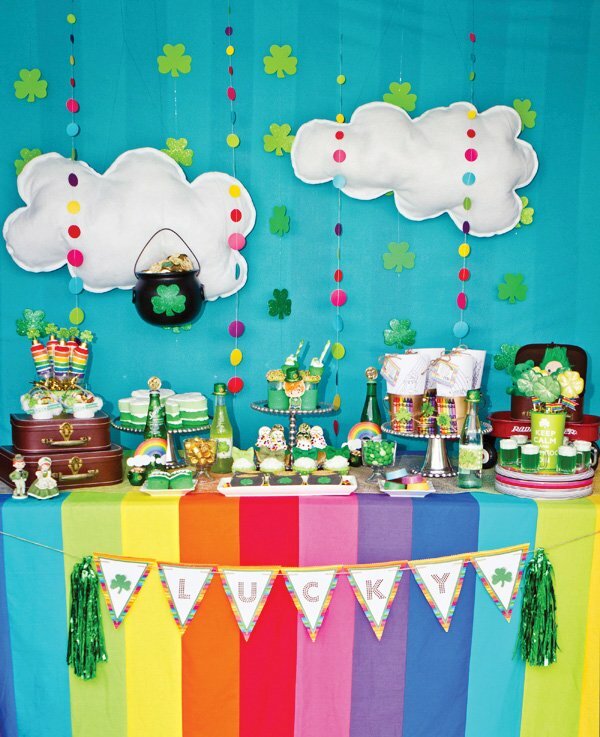 Love this…colors, theme, everything!!! 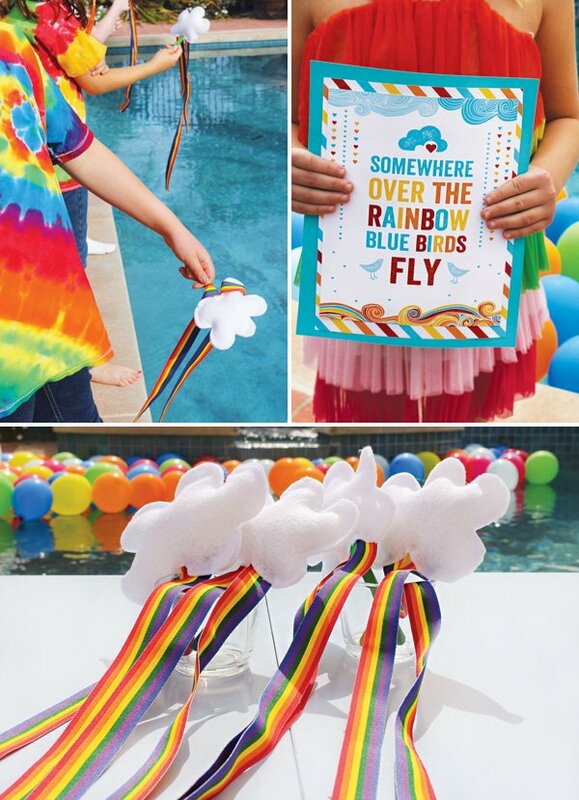 Looks like such a fun party! Love it! Those printables really spice up the tasting cups! 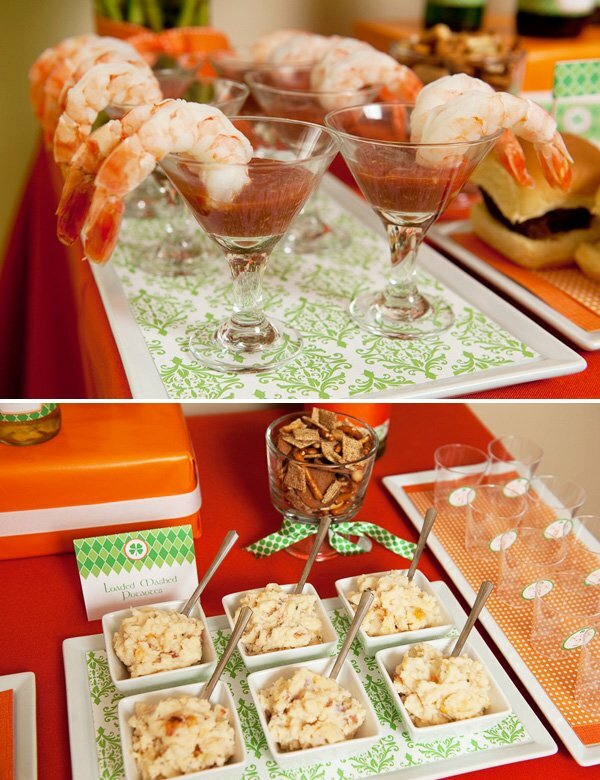 Everything in the orange and green is so bright and happy! Looks fun with great food choices! ADORABLE! You just don’t see many FUN adult parties anymore. I LOVE IT! Can’t wait to give it a try. where did you get the sliders or did ou cooked them yourself? I’m hosting a baby shower & i need to get atleast a 100 piece of sliders/burger. 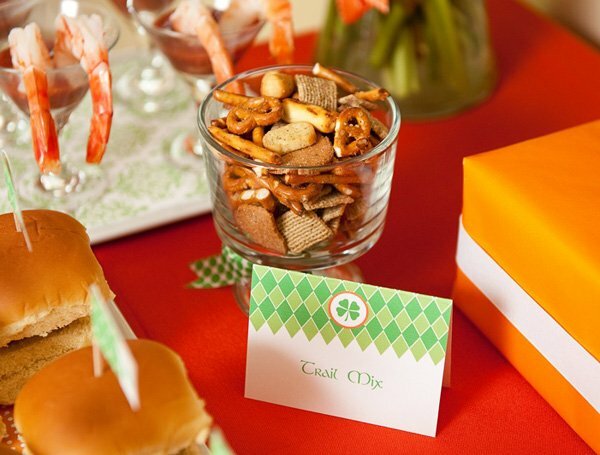 That looks like such a fun and entertaining St. Patty’s day party-so festive.I love all the labels for the food and beer. I found this on the site, it would be awesome if you were grilling anything! 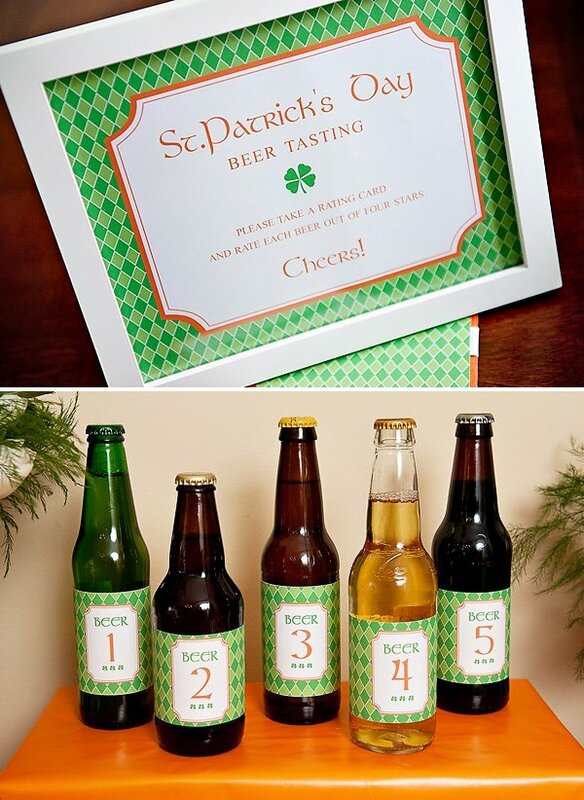 Love the beer tasting idea! Seems like a lot of work! But would def be worth it!